It's believed that Lucy's species lived somewhere between 2.9 million and 3.8 million years ago, overlapping in time with the new species. 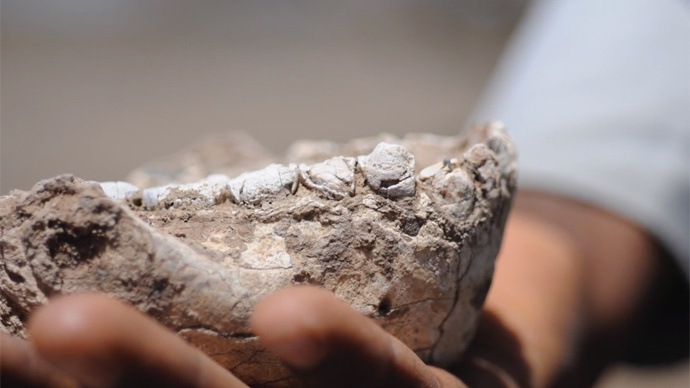 According to an international team of researchers, led by Dr Yohannes Haile-Selassie of the Cleveland Museum of Natural History, the new fossils present evidence that two closely related early human ancestors lived at the same time, before three million years ago. In the language spoken by the Afar people "deyiremeda" means "close relative." Scientists say Australopithecus deyiremeda differs from Lucy's species in the shape and size of its thick-enameled teeth, and its lower jaw architecture. The anterior teeth are also said to be rather small, indicating it probably had a different diet. "The new species is yet another confirmation that Lucy's species, Australopithecus afarensis, was not the only potential human ancestor species that roamed in what is now the Afar region of Ethiopia during the middle Pliocene," Dr Yohannes Haile-Selassie said, as cited by the EurekAlert! newsletter. "Current fossil evidence from the Woranso-Mille study area clearly shows that there were at least two, if not three, early human species living at the same time and in close geographic proximity." According to the study's co-author, Dr Beverly Saylor of Case Western Reserve University, the combined evidence from in-depth analyses estimated minimum and maximum ages of the new fossils at 3.3 and 3.5 million years. Scientists say the new species from Ethiopia "takes the ongoing debate on early hominin diversity to another level." However, Haile-Selassie warns some fellow scientists will be skeptical about the discovery. "I think it is time that we look into the earlier phases of our evolution with an open mind and carefully examine the currently available fossil evidence rather than immediately dismissing the fossils that do not fit our long-held hypotheses,"Haile-Selassie has said. Scientists have long maintained there was only one pre-human species at any given time between 3 and 4 million years ago. The 1995 discovery of Australopithecus bahrelghazali from Chad and the 1999 finding of Kenyanthropus platyops from Kenya, both from the same time period as Lucy's species, reshaped researchers' opinions. The turning point came with Haile-Selassie's discovery of the 3.4 million-year-old Burtele partial foot in 2012, in Eastern Africa. It meant that an early relative of modern humans - Australopithecus afarensis - may not have been the only hominin to have lived in the Afar region of Ethiopia about 3.4 million years ago. The Australopithecus deyiremeda specimen was discovered in 2011 at one of the Burtele localities. The scientists' findings have been published in the journal Nature.